The Daimler DS420 was a very large luxury car built by the British Daimler company (not the German one). It was available for an eternity: 1968 through 1992. It was a Daimler original, offered alongside rebadged Jaguars for its entire production run, even though it was based on the Jaguar 420G. Featuring a 141 inch wheelbase and powered by a 4.2-liter Jaguar straight-six that made 245 horsepower, the DS420 was used by the ruling families of both the U.K. and Sweden. It just looks like a car that would meander out of the grounds of some British palace somewhere, doesn’t it? More recently, the cars have been very popular on the British Wedding Car circuit. In 24 years, they built 4,141 limousines and sold 903 of these as a bare chassis. Only two were factory Landaulettes – this is not one of them as neither factory car exists today. Quite a few were converted to Landaulette form for the wedding car business, which this car was likely a part of. The car shows well enough but the engine looks complicated and the interior looks like a relatively nice British car from the 80s. The Landaulette conversion doesn’t really help or hurt the value, with this bringing an estimate of $14,000-$16,000. Click here for more from Brightwells. 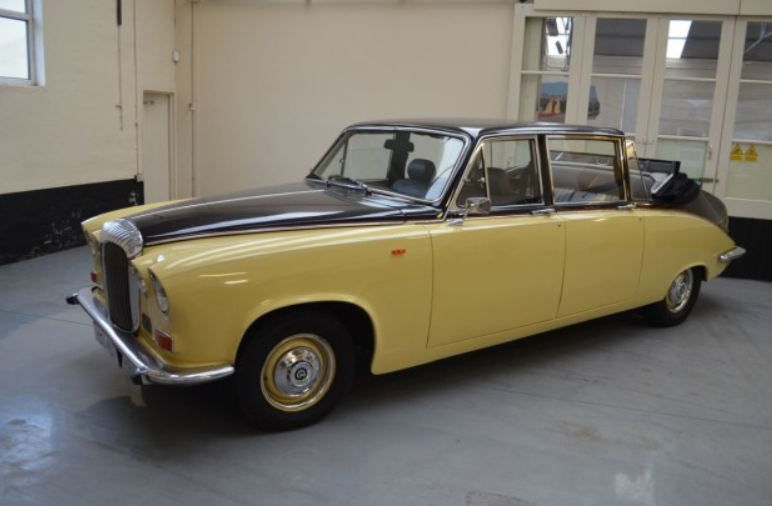 This entry was posted in Uncategorized and tagged 1985, auctions, brightwells, cars, classic cars, daimler, ds420, landaulette by classiccarweekly. Bookmark the permalink.